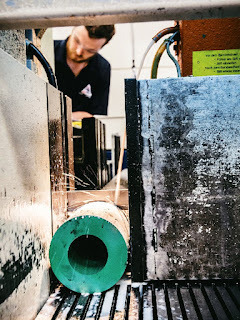 The continued growth in sales has placed award-winning Rotherham manufacturer, AESSEAL, amongst the UK's leading private mid-market growth companies. At the top of the table is automotive manufacturer, McLaren, which is set to open a new facility in the borough next year. With global headquarters at Templeborough, AESSEAL is the world's fourth-largest designer and manufacturer of mechanical seals for a wide range of industries, including oil and gas, food, water, mining and pharmaceuticals. AES has re-entered the prestigious Sunday Times Grant Thornton Top Track 250 at 180th, mixing it with the likes of Aston Martin, Holland & Barrett, Travelodge, Lush and The Hut Group. The 13th annual Top Track 250 league table ranks Britain's private mid-market growth companies with the biggest sales - the next 250 firms outside its Top Track 100 league table that ranks the top private companies with the biggest sales. They are compiled by Fast Track, the Oxford-based networking events and research company, which champions the UK's top-performing private companies and entrepreneurs. AES first entered the Top Track 250 in 2014 and is back for this year following impressive financial results for the year ending December 2016. Sales were up 6% on the previous year to hit £152m and profit was up by 14% to £21m. AESSEAL reported that, due to the decline in the oil price, all other major companies in the mechanical seal field, apart from AESSEAL, have seen declining revenues since the beginning of 2016, along with a substantial reduction in profitability and heavy job losses. The business was founded in 1979 by current managing director, Chris J. Rea, OBE and whilst he retains a majority interest and control at AES, international investor, 3i also holds a stake. Exports make up around 80% of sales and most of the seals and products are made in Rotherham. Rea told the newspaper that: "The decline in sterling we've seen gives us a more competitive currency, similar to the benefit Germany got by swapping the Deutschmark for the Euro." This year has seen AES continue to hit new heights. It posted record sales for March 2017 at just under £16m, nearly £2m greater than the previous record breaking month for the business. And the firm continues to invest. HRH The Duke of York was back in Rotherham in July to officially open a new £500,000 investment in its testing facility. McLarean Automotive is in pole position in the Top Track 250, posting sales of £649.8m for the year ending December 2016, up 44% on the previous year. Profit was up a massive 179% to £65.8m. Construction is underway on the new £50m facility on the Advanced Manufacturing Park (AMP) in Rotherham. The 75,000 sq ft McLaren Composites Technology Centre (MCTC) will enable the development and manufacture of the Monocell and Monocage carbon fibre chassis used in future McLaren models. The Woking-based company completed its 10,000th sports car last December, only five years after the first rolled out of its hi-tech production centre. It now has an objective of producing more than 4,500 vehicles annually by the end of 2022.